Wendy Bradley earned her physical therapy degree from Grand Valley State University. She holds a McKenzie certification and specializes in women’s health, TMJ, and vertigo. 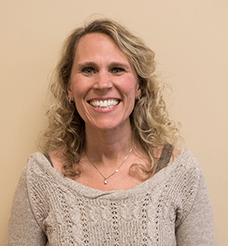 Wendy has been a licensed Physical Therapist since 2002. Outside of work, she enjoys visiting her cottage, spending time with her kids, and reading.